I used a Pololu USB AVR Programmer but you could use an FTDI breakout or similar. Avoid pain and anguish: use a good power supply. With a random, crappy 800mA wall wart, I experienced unreliable booting, hangs with USB devices installed, and even system freezes trying to set the password to my account! Download the image and, while you're waiting, continue below. You can see that /dev/sdd1, in my case, is the disk partition that was just mounted. It's partition #1 on disk /dev/sdd. In your case, it may be a different device path. You'll use dd to write the image to your disk. NOTE: Make absolutely certain you are using the disk corresponding to your microSD card. If you use the wrong device, you could lose data, or overwrite your OS. That's bad. However, it's easy to avoid making that mistake. Just be careful and pay attention. Use df to make absolutely certain you have the correct device. Then double-check your command line before you hit return. Is your kernel image done downloading? Ok, cd into wherever it's saved. In my case, I saw the TX light blink green, very slowly, while the kernel was updating. If nothing blinks, something is wrong. When the blinking stops, it's done updating. Unplug your pcDuino from power. Remove the microSD card. Now you can install the operating system. Next it's time to install Ubuntu operating system. This is where that USB flash drive comes in. Format your USB drive as FAT32 if it isn't already. Extract files out of the 7z file you downloaded, which will create an ubuntu folder. The two files inside that folder are update.sh and pcduino_ubuntu_20131126.img (20131126 is the date; there may be a different date on whatever file you grabbed)or whatever the date is on the filename). Move those files onto the root folder of your USB drive. It doesn't matter if there are other files on your USB drive. Unmount the flash drive and remove it from your machine. While you wait for the download, let's connect your Serial USB adapter to the debug port on the pcDuino so we can see what is going on. when you install the operating system. The debug port is a 3-pin header, next to the Menu button on the USB connector side. Data going into the pcDuino is closest to the USB connector (FTDI: TXO). The middle is ground. 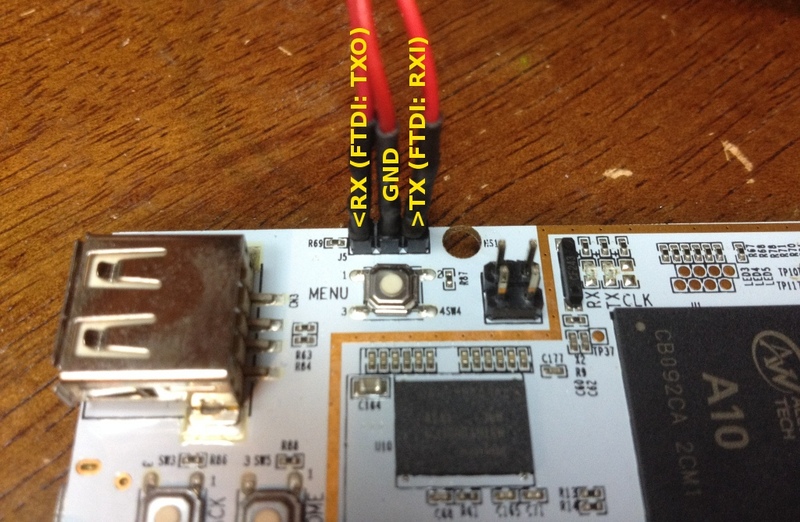 The pin closest to the A10 is for data coming out of the pcDuino (FTDI: RXI). Connect your serial USB adapter so that TX coming from the pcDuino goes into the RX pin of your adapter and TX coming out of your adapter is going into RX on the pcDuino. You previously removed power from your pcDuino and removed the microSD. We're about to power it up. Open your favorite terminal program (for example, minicom), connect to the USB serial adapter. Set the baud rate to 115,200, 8N1. Plug in power to your pcDuino and you should see it outputting a long string of text. Eventually it indicates that it is searching for update.sh (remember that file?). After some time, the update will complete. Remove the USB flash drive, and reset the board (or power cycle it). [    6.350000] Warning: this sunxi disp driver will see significant redesign. [    6.360000] Applications using /dev/disp directly will break. If you need to start over for any reason, remove the USB drive, reinsert the microSD card, and press reset. Doing so will reinstall the kernel and allow you to install the OS again.